My name is Phil Thompson, and my wife and I are behind Ravenswood-based Cape Horn Illustration. We create pen and ink home and building portraits for individuals and businesses who want to give their place of residence a lasting legacy. We've worked with clients getting home and business portraits for gifts and marketing pieces. 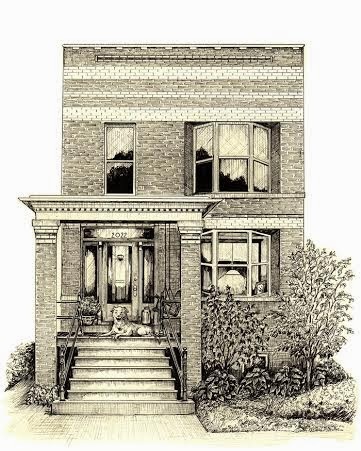 As readers of this blog know, Chicago is a rich place for residential architecture. There's so much to uncover about Chicago beyond the well-known landmarks in the loop. Our illustration work has brought us face to face with the distinctive styles of the city: The bungalows, two-flats (as above), A-frame cottages, and more. You can view a collection of examples here to see how what styles are represented in our work. All work is pen and ink on a heavy paper stock, and everything is drawn by hand. We prefer the classic, "etched" look because it exposes the labor of the work, each line and hatch-mark, behind a given home portrait. This method also gets us close to the details of the built environment; each building stone and ornament requires careful attention and concentration. For more examples of work, or to get in touch about getting a home portrait, check out our site. No walk in the (Lincoln) park! Biking in Chicago's "Thunder Snow"
The hordes are coming to Ravenswood!